The global smart textile market is highly consolidated, as the leading four players in the market held approx. 46% of the overall market in 2014. E.l. DuPont De Nemours and Co. held 20% of shares in the market; still, it faces strong competition from numerous small and medium-size specialty product-manufacturing companies. 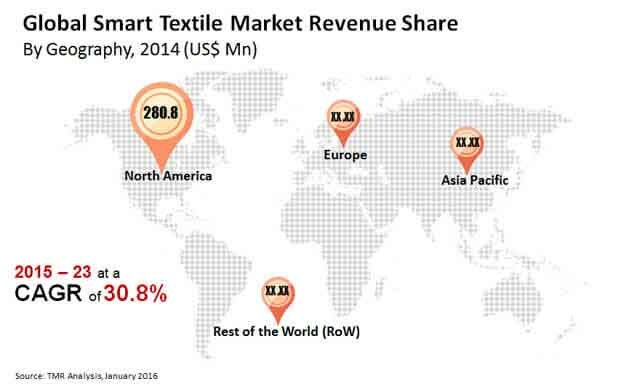 Some of the leading players in the market are Koninklijke Ten Cate N.V., E.l. DuPont De Nemours and Co., Texas Instruments Inc., and Gentherm Inc.
As per the TMR, the global smart textile market is estimated to attain a valuation of US$7.73 bn by the end of 2023 progressing from US$0.7 bn in 2014. The market is predicted to rise at an outstanding 30.8% CAGR during the forecast period 2015 to 2023. Based on application, the military and defense sector led the global smart textile market by holding 28% of shares in terms of revenue in 2014. During the forecast period, military and defense sector is expected to rise at a healthy 28% CAGR and is expected to maintain its dominance in the global market. On the basis of geography, North America led the smart textile market in 2014 by holding 40% of the share in the global market. In terms of revenue, North America will lead the market, especially in the sports and fitness sector by expanding at 32% of CAGR. Europe held the second position in the global smart textile market by holding 30% of the shares in 2014. The growing preference for wearable technology such as sensors and other types of electronic devices are the key factors responsible for the growing demand for smart textiles. The rising use of wearable technology that is widely used in heart rate sensors and in various other sensors to check fitness will also act as a game changer for the smart textile market. Significant use of these technologies is expected to change the way personal health is monitored. In addition, integration of wearable technology at a large scale and rapid advancements in the textile manufacturing are projected to revolutionize the global smart textile market in the near future. Some of the other factor factors contributing to the growth of this market are the increasing standard of living, rising disposable income, and growing spending in the medical technology and healthcare. Miniaturizing of electronic components, availability of sophisticated gadgets, and low cost of smart wireless sensors have grown the demand for smart textiles extensively and will augment the growth of the market in coming years. Conversely, there are certain restraining factors that may hamper the market growth. The high cost and lack of appropriate standards and regulations to monitor may impede the flourishing smart textile market. The high cost affiliated with the smart textile will also restrict the wearable devices only to the high-end customers that may limit the growth of the market. However, these restraints are not expected to have a long-term impact due to the growing popularity of the smart wearable technologies, thus bringing high growth opportunities in the global smart textile market. In addition to that, increasing research and development activities and rising contribution by the key players and manufacturers will eventually address these issues.